We all have some form of home office, whether it be a laptop desk next to the couch, or a room dedicated to desks and filing cabinets. Some people use their home office as an escape, and others see it as a dungeon. I tend to agree with those folks who use it as an escape. I would live in my home office if I could. I figured that since I had unpleasant things to do in there, like paying the bills, making to-do lists, catching up on work-related projects and other unpleasantness, I might as well make it a pretty place to be. 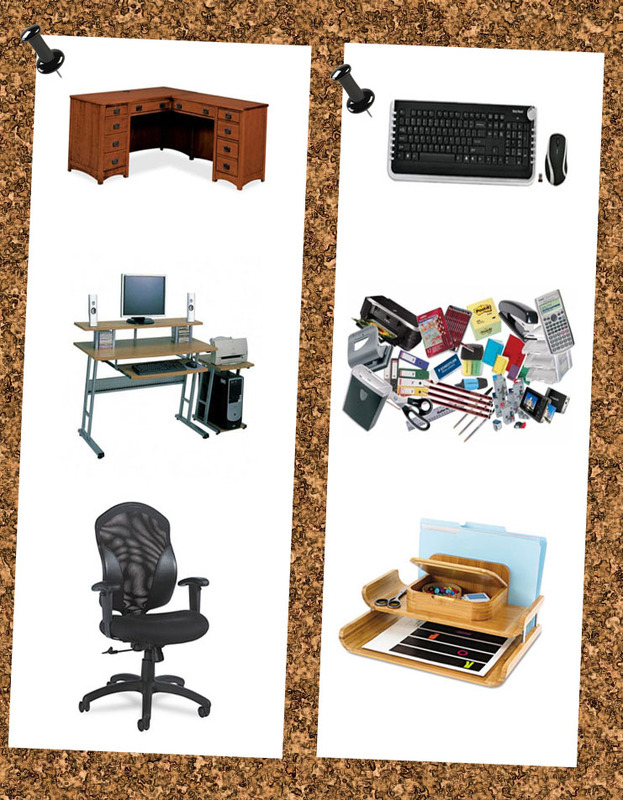 Your work space should be efficient and comfortable, allowing for maximum moveability and corraling clutter. I know there are those of you out there that thrive in clutter, but most of us need to have outward signs of organization. You also need a comfy chair. If you need to put a budget on the home office decorating, give the desk and the chair the most of the budget. I’ve listed a few things that would be a benefit in your home office, from desks to desk-top organization. Oh, and comfy chairs. You can never go wrong with a comfy chair! Desks – Depending on the space you have available, you can opt for a comfortable workstation to an executive desk with a credenza. To be comfortable, you should have enough space to hold your monitor, keyboard, mouse and writing space. Chairs – Support. Even if you have no back problems, you still need support. And comfy cushions. Especially if you work from home and spend eight hours a day at your desk. Its easier to get up and walk around when you work from home, but you still sit the majority of the time. It also helps to get a chair mat, which not only aids in easy movement but helps save your floors too! Peripherals – Your keyboard, mouse, speakers and other desktop peripherals should be within easy reach, and ergonomic to avoid injuries to your wrists and hands. Carpal tunnel is no laughing matter. Wrist wrests for both the keyboard and mouse are essential. Organization – You need a place to put all your binders, printer papers, and pens, right? Try to find an organizer that encompasses all that, instead of spreading many different organizers around your work space. There’s nothing in the world quite like knowing where the flash drive with the game saving presentation is, as opposed to searching for it through a messy desk. Supplies – Pens, pencils, paper clips, post-its, push pins, paper…we have so many accessories that we use to make a complete desk, and evidently they all begin with the letter P. Make sure you have your favorties at hand, and lay in a spare supply so you don’t run out. Bottom line is, have fun creating a home office that you won’t mind going into (or sitting down to), and may even come to love. Hang soothing pictures, play quiet music in the background…or even get a zen garden or desk top pool table!